The latest issue of the Automotive News Europe monthly magazine goes live on Monday, Feb. 6. 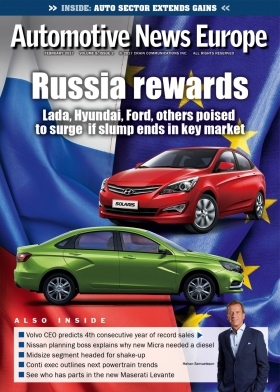 The new edition looks at whether Russia sales are ready to rebound after a four-year drought during which sales halved. Russia looks to have bottomed out, leaving manufacturers optimistic that 2017 will bring the first signs of recovery for a market with the potential to become Europe’s biggest for new-car sales. Nevertheless, executives interviewed for our cover story warned that this could be a slow recovery, taking years to return sales close to their peak level of 3 million. From Russia to the European market, where sales rose by nearly 930,000 last year, but volume remained almost 900,000 sales below the 16 million total reached during the market’s peak in 2007. See which groups and brands benefited most from the third-consecutive year of growth. Volvo sold a record 534,332 vehicles in 2016 and CEO Hakan Samuelsson expects to set a new all-time high for a fourth straight time in 2017. In a wide-ranging interview he explained why he is so bullish. Nissan’s head of planning, Philippe Klein, let us know why the automaker decided that it had to offer an oil burner again in its new-generation Micra subcompact despite declining demand for diesels in Europe’s small-car segment. From ultraluxury to low cost: Renault’s investment in Dacia continues to pay off in the showroom and on the balance sheet. What’s Dacia’s secret? It keeps making upgrades to its lineup without boosting prices for its refreshed models. Autonomous driving is the next frontier for personal mobility. John Krafcik, CEO of Waymo, formerly known as Google’s self-driving car project, explained that the company had to shut down a pilot program ahead of schedule because of growing unsafe behavior from drivers who put too much trust in the technology. At the opposite end of the spectrum, BMW offered a glimpse of what motorists could do with the extra time they get when the car is handling the driving. For the first time sales of premium midsize models were higher than their volume rivals in Europe last year. Our monthly segment analysis explains why this game-changing shuffle happened and why premium carmakers will gain more ground in the future. Continental teamed up with Schaeffler to create a mild hybrid based on 48-volt technology. The result is an affordable, easy-to-adapt solution that improves fuel economy by 20 percent, Continental powertrain boss Jose Avila explained. Last year ended on a positive note for Europe’s automotive companies. See all the winners as measured by the Automotive News Europe/PricewaterhouseCoopers Transaction Services Shareholder Value Indices. The Volkswagen Golf remained Europe best-selling model last year despite a 7.9 percent sales decline to 490,299 units. While the Golf has a dominant lead in Europe as whole, with an advantage of more than 181,000 units over its closest rival, the Renault Clio, it is not the champion in 20 European markets. We know this because we have teamed up with JATO Dynamics to provide the top 10 sellers in Europe’s 26 largest markets. The additional data will become a regular feature in the ANE monthly magazine starting this month.